Undergraduate Courses. The following is a description of upper level undergraduate IT courses. Graduate courses are described further down. IT 399: Directed Reading in IT (1-4) Reading under the supervision of an instructor on a topic in Information Technology. The topic, expected outcome, evaluation criteria, and the number of credit hours must be mutually agreed on by the student and the instructor. Course may not be used to fulfill major elective requirements. Consent of the department required for enrollment. Prerequisite: Consent of instructor and upper-level IT eligibility. IT 414: Database Design (3) The objective of this course is to present key concepts related to database design and implementation. Topics to be discussed include: database architecture, relational data model, SQL, database design life cycle, conceptual data modeling, relational database normalization, query processing, transaction processing, database security, and database administration. An introduction to new database models and distributed databases is included. This is a project-driven course. Prerequisites: IT 310. IT 424: Network Security (3) This course covers the fundamental concepts, principles, and mechanisms in network and distributed system security. The topics that will be covered include: network security primitives, distributed authentication, key management, secure communication protocols, firewalls, intrusion detection, traffic monitoring and analysis, email and Web security, etc. Prerequisites: IT 340, IT 422, and senior standing. 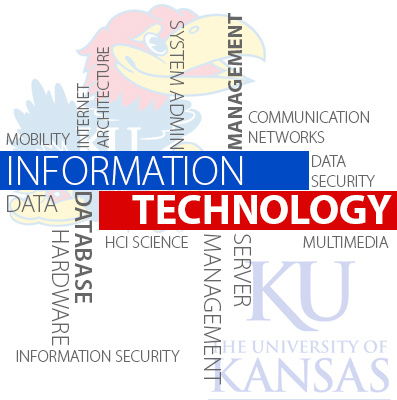 IT 452: Special Topics in IT (3) This course introduces a special topic of current interest in information technology, offered as the need arises. May be repeated for additional credit. Prerequisite: Upper-level IT eligibility and consent of the instructor. Graduate Courses. The following is a description of the EECS courses offered at the Edwards Campus. However the MSIT students are not limited to these courses; they may take any of the courses offered at the Lawrence campus (subject to adviser approval). IT 711: Security Management and Audit (3 credit-hours). Administration and management of security of information systems and networks, intrusion detection systems, vulnerability analysis, anomaly detection, computer forensics, auditing and data management, risk management, contingency planning and incident handling, security planning, e-business and commerce security, privacy, traceability and cyber-evidence. Prerequisite: Graduate standing. EECS 767: Information Retrieval (3 credit-hours). The objective of this course is to give students a hands on introduction to information retrieval systems. Classic textual information retrieval systems are studied, followed by presentation of current research in the area. Topics include: file structures, term-weighting schemes, text preprocessing, World Wide Web search engines, multimedia retrieval systems, artificial intelligence applications. Prerequisites: EECS 746 or graduate standing in EECS. IT 780: Communication Networks (3 credit-hours). Comprehensive in-depth coverage of communication networks with emphasis on the Internet and the PSTN (wired and wireless). Extensive examples of protocols and algorithms are presented at all levels, including: client/server and peer-to-peer applications; session control; transport protocols, the end-to-end arguments and end-to-end congestion control; network architecture, forwarding, routing, signalling, addressing, and traffic management; quality of service, basic queuing (basic M/M/1 and Little's law) and multimedia applications; LAN architecture, link protocols, access networks and MAC algorithms; physical media characteristics and coding; network security and information assurance; network management. Prerequisites: Basic working knowledge of computer systems, the Internet, and probability and statistics; basic programming skills. Credit may not be received for both EECS563, EECS663 and EECS780. EECS 801: Directed Graduate Readings (3 credit-hours). Graduate level directed readings on a topic in EECS, mutually agreed-on by the student and instructor. May be repeated for credit on another topic. EECS 802: EECS Colloquium (0.2 credit-hours). A student is expected to attend 12 professional talks or presentations. These can be scheduled EECS/ITTC colloquium talks, MS thesis or PhD dissertation defenses, or professional talks or seminars. Prerequisites: None. EECS 819: Cryptography (3 credit-hours). Introduction to the mathematical background, basic concepts, components, and protocols to enforce secrecy, integrity, and privacy through cryptographic mechanisms. The concept of symmetric and asymmetric encryption, integrity verification, authentication, key establishment and update, and authorization. Emphasis on the design of protocols that apply and integrate various modules to achieve safety objectives: time-stamping, digital signature, bit commitment, fair coin-flip, zero knowledge proof, oblivious transfer, and digital cash. The policies for key generation and management, information storage and access control, legal issues, and design of protocols for real applications. EECS 881: High-Performance Networking (3 credit-hours). Comprehensive coverage of the discipline of high-bandwidth low-latency networks and communication, including high bandwidth×delay products, with and emphasis on principles, architecture, protocols, and system design. Topics include high-performance network architecture, control, and signalling; high-speed wired, optical, and wireless links; fast packet, IP, and optical switching; IP lookup, classification, and scheduling; network processors; end system design and protocol optimization; network interfaces; end-to-end protocols, mechanisms, and optimizations; high-bandwidth low-latency applications; storage networks. Principles will be illustrated with many leading-edge and emerging protocols and architectures. Prerequisites: EECS 563 or 780. EECS 882: Mobile Wireless Networking (3 credit-hours). Comprehensive coverage of the disciplines of mobile and wireless networking, with an emphasis on architecture and protocols. Topics include cellular telephony; MAC algorithms; wireless PANs, LANs, MANs, and WANs; wireless and mobile Internet; mobile ad hoc networking; mobility management; sensor networks; satellite networks; and ubiquitous computing. Prerequisites: EECS 563 or 780. EECS 899: Thesis (1-6 credit-hours). A research project, designed and executed under the supervision of the chair and approval by members of the graduate committee. The student will develop and perfect a number of skills including the ability to design, conduct, analyze, and report the results in writing of an original, independent scientific investigation.